Is This A White Motorola DROID Ultra With A Black Kevlar-Encased Chin? Motorola is likely going to take the wraps of a new generation of DROIDs for Verizon Wireless soon, which would explain the recent leaks. 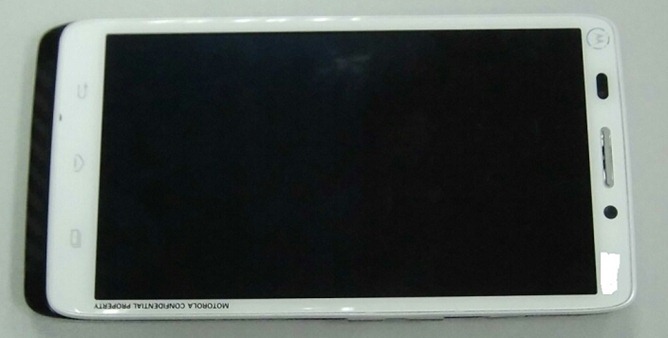 The newest photo reportedly depicts the DROID Ultra (XT1080). There are a few interesting things going on here. Firstly, this device has a strange black chin at the bottom. It looks like a shadow at first, but you can make out the faint pattern of Motorola's beloved kevlar material on it. It would appear the manufacturer is again making white phones that are only white on the front, but the wrap-around thing is new. Also of note, this device has capacitive buttons just like the supposed DROID MAXX render from the other day. The tiny Moto logo in the corner looks like the new version of the logo, so that matches at least. We don't know how large the Ultra is, or how it compares to the DROID MAXX (both have been reported as having the same model number). We might find out at Motorola's July 11th event, but nothing is certain yet. As with all leaks, this could be a fake – it was posted by a new user on XDA with no other posts.